Mr. S.L. Khan, the renowned engineer, comes with another useful tutorial for civil engineering students. 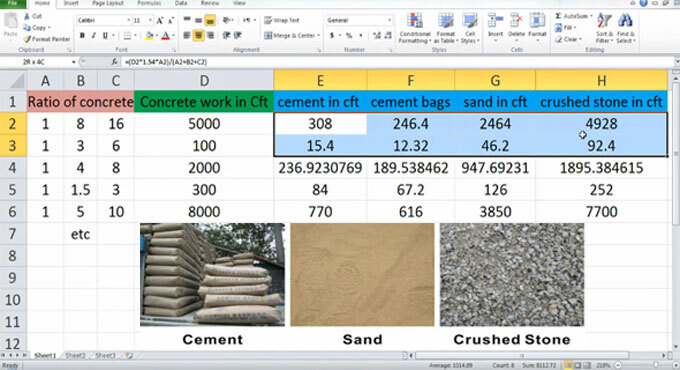 In this video, you will how to create your own spreadsheet to determine the volume of cement (in cft & bags), sand and aggregates. You have to just provide the proportions of concrete and volume of concrete. After pressing enter, the desired result will be shown automatically. You can save your huge time in calculation. Suppose, proportion of concrete is taken as 1:2:4. (one part cement : two part sand : four part aggregates). Volume of concrete work is taken as 500 cft. Now, in order to determine the quantity of cement in cft., put the cursor on the specific cell of concrete volume and apply the formula i.e. =(D2*1.54*A2)/(A2+B2+C2). Here 1.54 is taken to convert wet volume of concrete to dry volume of concrete. After putting the value, we get (Volume of concrete x 1.54 x proportion of cement)/(sum of proportions) i.e. (500 x 1.54 x 1)/7 = 110 cft. To convert it to bags, just divide it with 1.25 (the country’s bag volume). In this way, you can make the other calculation. For more information, watch the following video tutorial.